What kinds of questions do you need to ask to find the right drug rehab for you? Families searching for care for someone in need have plenty of options, but they will need to ask in-depth questions about the facility’s focus, treatment options, accreditation, and cost in order to make an informed choice. Understanding treatment options and interviewing providers can be time-consuming, but the work can help the family settle on the right provider, at the right price, for a person in need. Perhaps unsurprisingly, amidst a backdrop of such widespread substance abuse, there are thousands of drug and alcohol rehab centers people can seek help from when their use develops into an addiction. 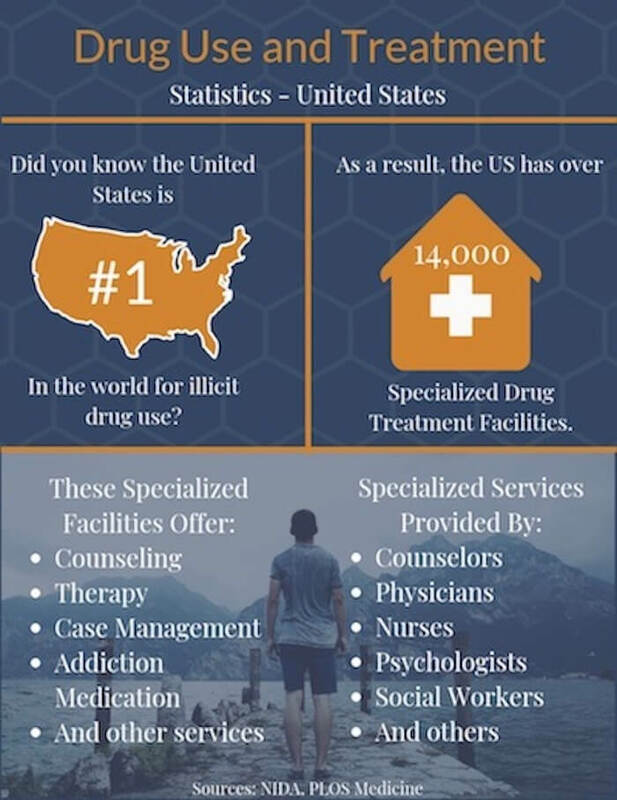 The National Institute on Drug Abuse (NIDA) reports that there are more than 14,500 specialized drug rehab centers in the United States.2 There are many other providers in private practice that offer help to people with addictions. Twelve-step fellowships and other support groups are also available to assist people who do not want to get formal professional help. If you are searching for a drug rehab center for yourself or for someone you love, this is all good news. It is clear that you have options available, and there is bound to be a provider out there that can assist you or your family with the addiction problems you face. But which option should you choose? And more importantly, how can you be sure that the option you do choose is the right one? This guide can help. Here, we will detail the options open to you, along with important questions you can ask before you settle on a specific provider. When people need rehab help, they often look for a specific type of facility. However, rehab facilities can do a number of different things. Some facilities tackle just one part of the recovery process, such as detoxification, without specializing in longer-term care or being equipped to address every aspect of care a person with an addiction might need (e.g., dual diagnosis treatment, concurrent management of medical issues). So if you’re looking for help with an addiction from a specialized drug rehab center, you may benefit from doing a little more research. Specifically, find out what kind of care the facility offers and what format is available. Below are a few of the drug rehab varieties available to your family. Medical detox is often considered the first stage in the recovery process. During medical detox, a dedicated team helps soothe physical distress and alleviate psychological concerns. Someone addicted to illicit opioids like heroin, painkillers like Vicodin, benzodiazepines, or alcohol may need medical detox to help treat the symptoms of withdrawal . The symptoms of benzodiazepine or alcohol withdrawal can be life-threatening. Opioid withdrawal is often intensely unpleasant and difficult for people to endure. People who have abused other kinds of drugs may also need medical supervision if they are at risk for medical or psychiatric complications. Ambulatory medical detox, without onsite monitoring: Someone receiving this care might visit a doctor’s office for medication management and scheduled, periodic evaluations rather than daily monitoring. Ambulatory medical detox, with onsite monitoring: In this model, someone visits a hospital or other clinical setting and receives regular medical monitoring from licensed nurses or other medical professionals during these visits. Medically monitored inpatient medical detox: In this model, the person has 24/7 access to medical detox services. Medically managed intensive inpatient detox: This model provides acute care for medical and mental health conditions during detox. Simply asking whether or not a facility can assist with detox is probably not an effective strategy. You will need to know more about what type of care you might require given your specific substance use history as well as what level of medical detox the facility is equipped to deliver to make the most informed choice. For example, if you have used drugs and/or alcohol for a long time and have any medical or psychiatric conditions, you may need a medically managed inpatient detox. If the program only provides social or nonmedical detox, that may not be adequate for your situation. And while detox is a vital phase of early recovery, it does not constitute comprehensive addiction treatment. People who complete detox need to address the root causes of the addiction, which often requires behavioral therapy. Without further treatment, people who only go through detox are at risk of relapse. How Long Are Drugs in the Body? 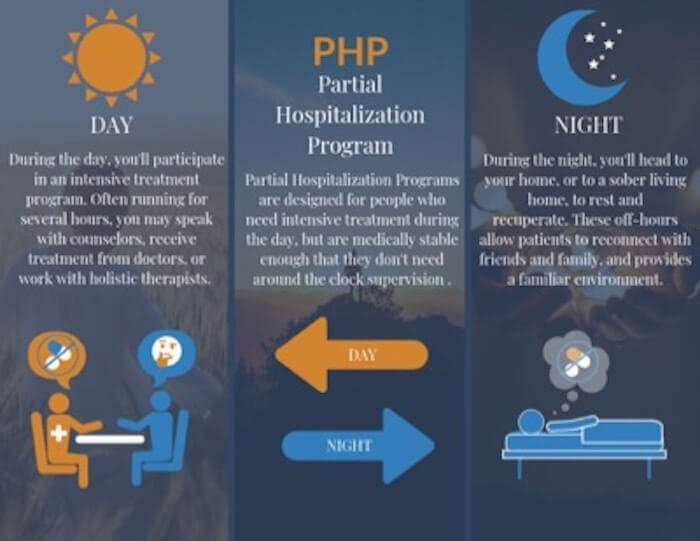 PHPs provide intense care for several hours each day, but the person in treatment might go home at night or head to a sober living home during off hours. This option is designed for people who are medically stable enough to live at home, but who benefit from the relatively intense supervision, structure, and guidance provided during treatment hours as they work on their recovery. People in PHPs might need regular medication for drug withdrawal, or they might need medical monitoring for issues that are serious but not life-threatening. In addition, PHPs, according to research published in the Journal of Psychosocial Nursing and Mental Health Services, provide recovery-oriented services.5 They do not simply attend to physical ailments caused by drugs. These are programs that assist people with skills they will need in order to stop using drugs. But their rigorous nature ensures that participants stay healthy and supervised while that healing takes hold. Education about drug use and addiction, and preventing relapse. 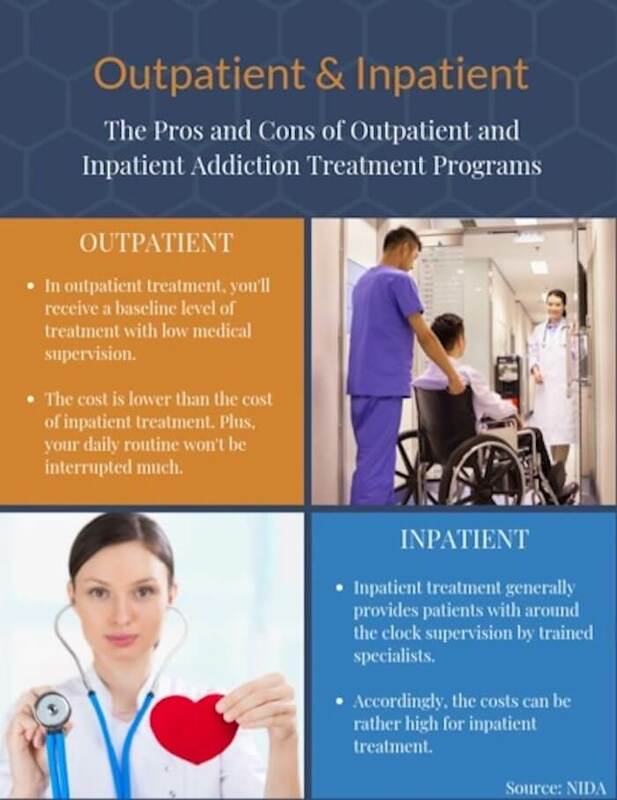 Many inpatient rehabilitation programs are equipped to deliver care for concurrent mental and medical health issues in addition to addiction treatment. This type of care may take place in a hospital or standalone, residential center. People enrolling in these programs may have medical or psychological issues in addition to their drug abuse and the intensive environment of an inpatient program can help them stay on track in recovery. Your family might choose an inpatient rehab for a loved one who has a long and complex history with drugs, or who has tried other recovery options in the past. Sometimes, the place the person lives, or the people that person sees, impedes the recovery process, and that can make maintaining sobriety very difficult. An inpatient program removes people from the people, places, and things that can trigger them in their home environment. People in these programs receive medical care and medications, if needed, as well as the support of staff and peers in a recovery community. Most programs hold group and individual therapy sessions and other activities that promote sobriety. They may also host 12-step meetings. The amount of time someone spends in an inpatient program depends on their insurance, severity of addiction, recovery progress, and other factors. Most programs last anywhere between 28 and 90 days. The person you love might be physically healthy, and the person might live in a supportive and safe home. Those are all great benefits, in terms of recovery. However, a structured, time-intensive treatment program may still be the appropriate level of care. Even with a supportive home environment, some recovering individuals may still have an especially high risk of relapse without some kind of intensive drug care. An IOP can fill that need. SAMHSA reports that IOPs provide at least 9 hours of therapy per week, typically delivered in 3-hour blocks.7 That means IOPs require a great deal of work from a person in recovery. These are not simple rehab programs your loved one could complete with an already packed schedule. These are programs that combine the intensity of inpatient care with the comforts of home. Group therapy (psychoeducational groups, skill-development groups, stress management, relapse prevention techniques, and others). Medication management and medical treatment. People may transition to an IOP as a “step-down” level of care after completing an inpatient/residential program or enroll in an IOP as their first attempt at recovery. If your loved one has completed inpatient care, is not able to take time off from work or other responsibilities, or does not need an intensive level of care, outpatient rehab might be a good option. Here, addiction therapy is provided in a series of appointments that could, in some cases, be spaced far enough apart to accommodate other tasks. The person you love could keep working, going to school, and volunteering in the community, all while in therapy for addiction. A main benefit of outpatient care, per NIDA, involves cost.8 These programs can be much less expensive than inpatient programs. But outpatient programs do not provide as intense a level of supervision as inpatient programs, which could be problematic for people who face temptations to relapse in their daily lives. While facilities might seem like a go-to choice for addiction care, there are other outlets of help for addiction treatment. For example, mental health providers (licensed psychologists, therapists, etc.) may provide regular counseling as a form of outpatient care for people with addictions. The Bureau of Labor Statistics reports that there were close to 260,000 counselors treating substance abuse and behavioral health issues in 2016, and employment in the field was expected to rise to 320,000 by 2026.9 These numbers suggest that there are many people who could assist with an addiction issue. Keep in mind that some of these people could be working in private practice, not in a facility that specializes in addiction. The prevalence of these providers makes this kind of care an enticing option. But there are drawbacks, as addiction providers working independently may not be able to provide the full suite of services that a facility can provide. The services and therapies providers offer may vary dramatically from state to state, and they will also differ based on the educational background of the treating professional. For example, a psychiatrist may be able to diagnose a mental illness and prescribe medications for that illness. But a clinical social worker or therapist will probably not have those same prescriber rights (though they may work closely with physicians that they may commonly refer to, in instances that require it). Working with a provider in private practice can also mean dealing with different insurance and billing processes as well as session or treatment costs. That could make some providers that seem inexpensive a little more expensive when all of the bills come due. Some people attend group meetings as a form of self-help and ongoing support after they have finished a treatment program. At support group meetings, people share their experiences with others who are in recovery and are encouraged to work with a sponsor as they complete the recovery steps. The meetings are not led by professionally trained mental health therapists, but by recovering addicts. While peers can deliver support and understanding, it is often best to work with a mental health professional to gain insight as sobriety develops. 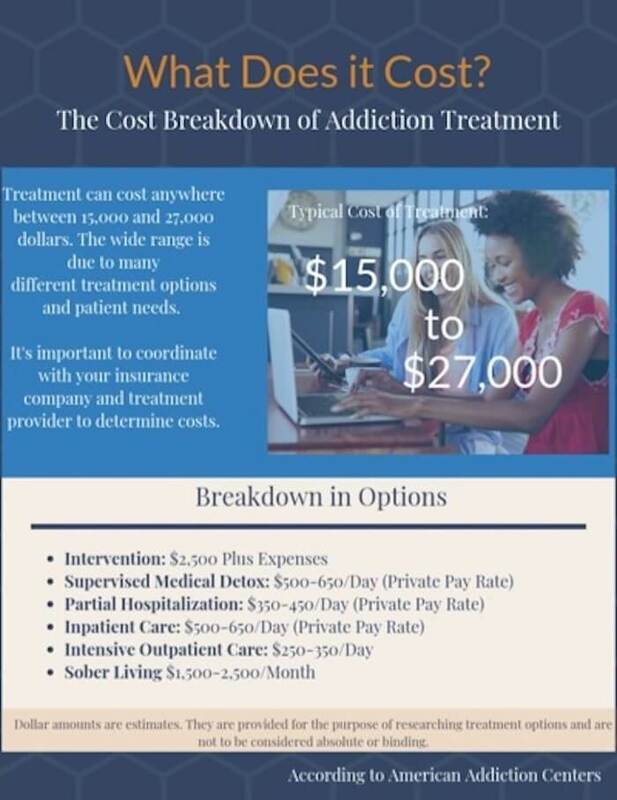 Cost and expertise – these are the 2 factors you will need to balance as you look for the right addiction care provider. You do not want to choose a group that provides rock-bottom pricing if they cannot deliver the care the person needs to start the recovery process. And you may want to choose the most experienced, top-of-the-line provider if the person who needs care can benefit from a less intense form of treatment. So how can you find balance? Your treatment provider may help. How long the addiction has been in place. Which therapy options people have used in the past. How the addiction is affecting the person’s life. Which therapies the insurance company might be willing to cover. With that information, and a few follow-up phone calls, the staff can make a recommendation on a treatment program. Should insurance cover part of that care, the staff can work on preauthorization issues, too. — Eric Cox, Call Center Training Specialist at American Addiction Centers. At American Addiction Centers, this process takes about 24-48 hours. Other providers might need more or less time to do that work, and the results can vary. Once you know the specifics involving program type and price, you can work on your final selections. There are a few great questions to ask each provider before you settle on a final choice. The therapy options your loved one needs can be based on all sorts of factors, including addiction history and personal preference. But the facility may have standardized plans to show you that can give you a feel for how similar issues are treated by that provider. What kind of supervision do you offer? This is an especially important issue to clarify if you are choosing an inpatient program. You will need to know what sorts of resources the staff can provide in order to ensure that the person does not have the opportunity to relapse. How much one-on-one therapy time will you provide? It can be helpful for the person you love to have access to a counselor in one-on-one therapy sessions. Asking this question ensures that the facility you choose will provide that kind of care. What licenses and accreditation do you hold? This subject can be somewhat complicated, as the license and certification requirements can vary depending on the state and facility type. Some individual providers do not need the same oversight that a facility does. So you will not get the same answer from different provider types. They need different things in order to get the job done. But the people you ask should be able to demonstrate compliance with at least some oversight committees and groups. Those that cannot show that they are in compliance might best be avoided. Understanding your treatment options and seeking out that perfect treatment provider can be a time-consuming task, but your work is worthwhile. After all, everything you learn about addiction and every step you make toward a treatment decision could help the person you love to heal. Sometimes, that work could even help you to heal. We hope this guide helps you to get started. What is included in your treatment price? Families can use insurance, private pay, and/or private loans to cover costs. An addiction left untreated can punch a huge hole in a family’s budget. An analysis in Forbes suggests, for example, that a person living at the poverty level could expect to spend up to half of every dollar of income on the addiction. That leaves little funds available for other vital expenses, including food or housing.12 Families can break that cycle by investing in drug rehab. “Some families have gone through similar processes of getting their loved ones in treatment on numerous occasions, so they expect the price point,” says Eric Cox, Call Center Training Specialist at American Addiction Centers. But sometimes, families are unaware of the costs they will be expected to cover when they ask for this vital help. They are unaware or surprised when the admission process moves forward, and the numbers start to become clear. That’s why this guide was created. Here, you will find information about all the options you might use in order to cover your loved one’s recovery journey. Dollar amounts in this guide are estimates. They are provided for the purpose of researching treatment options and are not to be considered absolute or binding. This guide may also contain information or solutions that American Addiction Centers does not offer. This information is still included to provide you with a comprehensive resource. A family that wanted to buy a car could simply hop online, type in a few pertinent notes, and come across detailed lists about pricing gathered from all across the country. With that information, they could determine which car dealership had the best price and which car was the right one to meet their needs. Unfortunately, the rehab industry is a little different. According to Cox, rehab can cost anywhere between $15,000 to near $27,000, and that huge variability is due, in part, to the nature of a well-structured rehab program. Unlike cars, which might come with a specific set of details and functions, rehab is almost endlessly variable. Some people need more recovery components than others, and some need in-depth services that others can skip. Some have plans that change midstream, which can cause a rise or dip in fees. And some have complications that necessitate screenings the family did not plan for. All these things make pulling together ballpark figures very difficult. As Desir’s comments make clear, families looking for treatment help are not required to determine what kind of care the person needs and/or what ancillary services might be beneficial. Those are steps the admissions staff might handle. But families are required to determine if the proposed care is worth the cost, and that can be a difficult thing to do. How much is real recovery worth? And how much does it cost to get there? Defining the goal of treatment could help families to answer those questions. Health: Physical and mental health concerns that cause discomfort, distress, or both should be treated or managed. Home: The person should have access to a safe and comfortable place to live. Purpose: Meaningful activities, such as work, volunteerism, or creative endeavors, should be part of daily life. Community: Social networks that foster feelings of friendship and love should surround the person. A program that can help a person with addiction to move in this healthy, confident direction might be worth the cost. Those programs that cannot, or that will only assist with some points and not others, might not deliver the value the family is looking for. But this is a subjective consideration, to be sure. One cannot put a price on a feeling of home and community, for example, and it can be difficult to determine if a facility can really provide all that it claims to provide. But before families leap away in fear at the first mention of price, it can be helpful to remember what rehab is designed to deliver: real healing. It’s clear that drug rehabilitation is worth the price of admission, but how can families pay for this care? 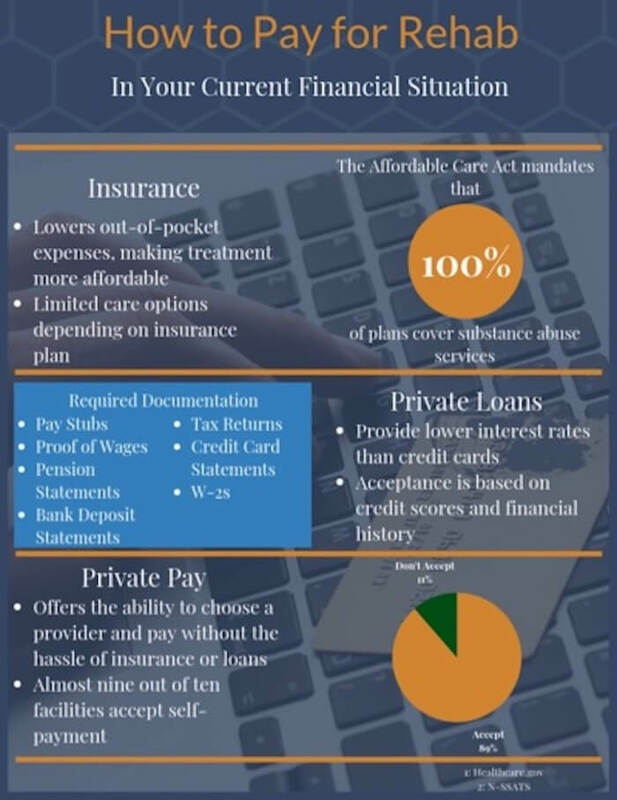 There are numerous different options that could be useful, and 2 of those options (private loans, private pay) have nothing to do with insurance coverage. Some families choose to pay for rehab services out of the family’s checking or savings account. According to Cox, there are benefits to this option. “The greatest benefit is control of care and location,” he says. “With insurance, a client is at the mercy of that insurance policy as to the quality of care that can be sought.” When people pay with cash, they answer to no such authority. They can choose a provider and pay without that hassle. There’s certainly no stigma attached with borrowing money. Consumer debt is expected to rise to $4 trillion by the end of 2018, which seems to suggest that almost every household in America has some type of outstanding loan.15 When there are needs the budget cannot cover, using loans seems reasonable to most people. Proof of identity, such as a driver’s license or passport. Proof of income, such as pay stubs or proof of wages. Proof of residence, such as driver’s license, utility bill, or signed lease. All of these documents allow loan officers to dig into a person’s history of paying back debts, and they can provide officers with a glimpse into a family’s ability to pay back the loans they need. American Addiction Centers uses an outside broker to assist with this process, Cox says. “There are some stipulations to an applicant being approved for the requested loan,” he says. So families will need to keep that in mind. Some providers cannot loan money to families, as those families do not have great credit scores or financial histories. While families might choose to use loans or cash to pay for rehab, they might also choose to rely on their insurance coverage. The Affordable Care Act (ACA) is one option for people who are not able to get insurance through an employer. Regardless, it makes sense for families to at least explore their insurance options, so they can make sure they are getting the healthcare assistance their insurance plans should pay for. In general, however, this is a process that tends to move quickly, as people with addictions benefit from access to treatment as soon as possible. When prospective clients and their families first contact American Addiction Centers about beginning the process of treatment for addiction, they can also jumpstart the process of managing the financial aspect of recovery. 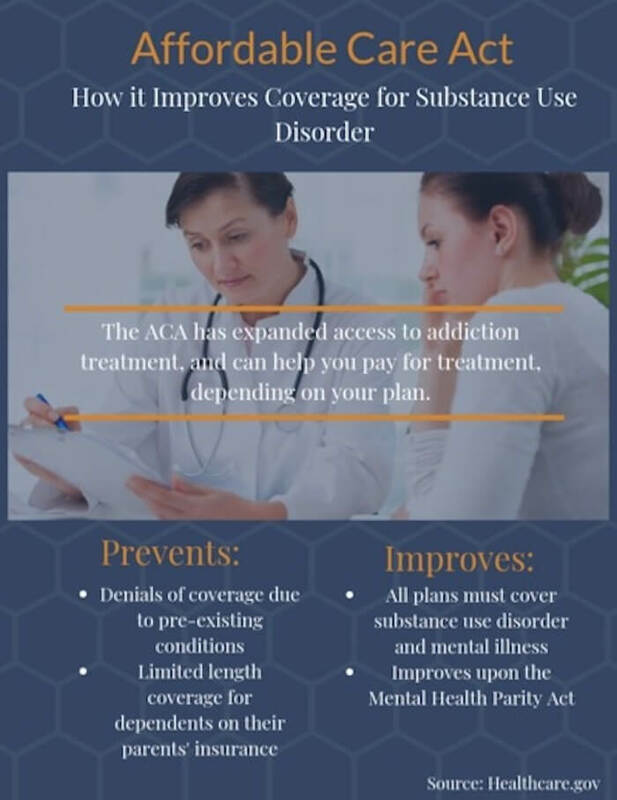 In most cases, families and their loved ones in need of treatment of addiction will begin by determining which treatment services and programs will be covered by their health insurance policy and what costs will be associated with treatment. This begins with a quick “pre-admission” assessment done with a treatment consultant over the phone that is then sent to AAC’s Verification/Placement department. Johana Desir is the Director of Assessment and Placement at AAC and the resident insurance process expert. She encourages callers interested in treatment to have their insurance card available for the pre-admission assessment and to be prepared to answer any questions about the nature of their addiction and how it has impacted their lives. 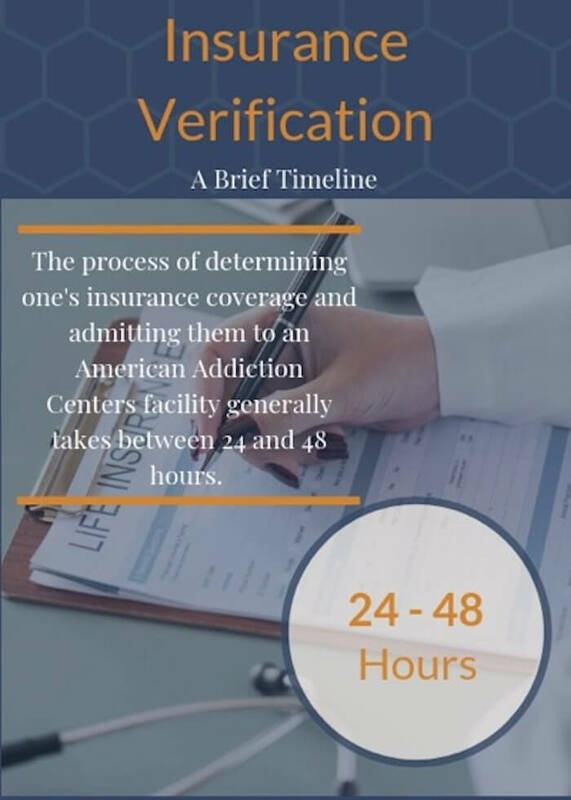 From the initial call made by a prospective client or family member to American Addiction Centers, the process of determining insurance coverage and admitting the person to one of our facilities generally takes only 24-48 hours. Once admitted, all pertinent financial documents and admission paperwork will be explained and then signed at the facility. That is a process other facilities might use, too, although their timelines might differ a little. Every family will need to consider these issues carefully, weighing all the options before choosing a plan that seems right for the person who needs care and the family that needs to pay for that care. 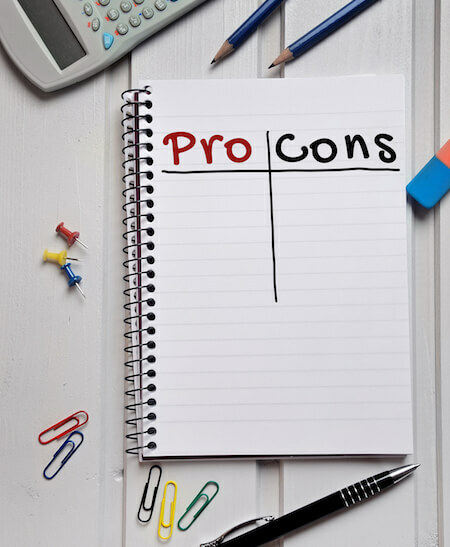 There are many pros and cons to consider. Health insurance can help to keep the overall cost of care down, as families won’t be asked to shoulder the burden of all the bills alone. But again, insurance companies keep control over things like provider type and length of stay, so families will have limits. That is a con that is too big for some families to tolerate. As you are deciding how you might choose to pay for care, it could be worthwhile to understand how much specific aspects of care cost. You could, in theory, use this information to help you plan. You might pay for some aspects of care yourself, for example, while leaving other aspects up to insurance. If these fees seem high, the 2016 National Survey of Substance Abuse Treatment Services found that about 59% of facilities used sliding-fee scales to determine exact charges for rehab. That means families in dire financial straits might pay less than this amount for the help required, but not all facilities offer this service. If you are looking for assistance with a very real and very persistent addiction problem that is touching your family, you do not have to do the work alone. Most providers are adept at explaining rehab options, including costs, so you can understand just how much you will need to pay and how the program will work. If you do choose to use insurance, representatives can work with the rehab provider on preauthorization and other paperwork, so you will not have issues to handle when you are working to recover. Do not let cost stand in the way of a fight against addiction. The options outlined here could make your rehab journey affordable and attainable. As always, we are here to answer any questions you may have about how rehab works and how it may benefit you.
. Degenhardt, L. et al. (2008). Toward a Global View of Alcohol, Tobacco, Cannabis, and Cocaine Use: Findings from the WHO World Mental Health Surveys. PLOS Medicine, 5(7), e141.
. Substance Abuse and Mental Health Services Administration. (2018). Key Substance Abuse and Mental Health Indicators in the United States: Results from the 2017 National Survey on Drug Use and Health.
. Yanos, P. et al. (2009). 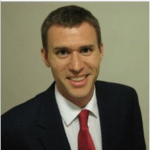 Partial Hospitalization: Compatible with Evidence-Based and Recovery-Oriented Treatment? Journal of Psychosocial Nursing, 47(2), 41-47.
. Nebraska Department of Health and Human Services. Partial Hospitalization.
. National Institute on Drug Abuse. (2018). Types of Treatment Programs.
. Bureau of Labor Statistics. (2018). Substance Abuse, Behavioral Disorder, and Mental Health Counselors: Job Outlook.
. National Institute on Alcohol Abuse and Alcoholism. The Role of Mutual-Help Groups in Extending the Framework of Treatment. Alcohol Research & Health, 33(4).
. Szalavitz, M. (2013). Q&A: What Really Goes on In Drug Rehabs. TIME.
. Bosari, J. and Money Wise Women. (2012). The Cost of Addiction on Families. Forbes.
. Substance Abuse and Mental Health Services Administration. (2018). Recovery and Recovery Support.
. Substance Abuse and Mental Health Services Administration. (2016). 2016 State Profile—United States and Other Jurisdictions: National Survey of Substance Abuse Treatment Services (N-SSATS).
. Kornish, L. (2018). Consumer debt is set to reach $4 trillion by the end of 2018. CNBC.
. Leshnoff, J. (2016). How to Get a Personal Loan. One Main Financial.
. Ladika, S. (2012). Personal Loans on the Rise, but are They Right for You? Fox Business.
. Centers for Medicare & Medicaid Services. Minimum Essential Coverage.
. Healthcare.gov. The ‘metal’ categories: Bronze, Silver, Gold & Platinum.
. O’Donnell, J. and Ungar, L. (2015). Obamacare reduces maximum out-of-pocket costs, but not enough for some. USA Today.
. Consumer Financial Protection Bureau. (2017). What is a debt-to-income ratio? Why is the 43% debt-to-income ratio important?